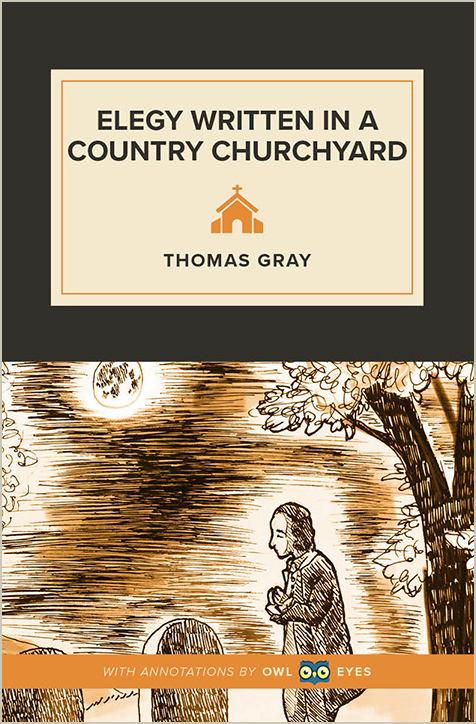 Thomas Gray’s “Elegy Written in a Country Courtyard” is one of the most loved and best known poems in English. Using a form similar to an ode, Gray paints a dreamy, quiet scene of a speaker walking through a graveyard behind a church. Listening to the cow bells tinkle as herds return home and the church bells signal the end of the day, the speaker begins considering the simple gravestones and the people who lie beneath them: imagining their rustic lives and meditating on how their daily tasks and worries came to nothing in death. The speaker’s thoughts travel forward into the future, picturing how others would look upon the speaker’s own grave and read its epitaph there, a final stoic approach to the inevitability of death. The poem juxtaposes images of wealth and poverty as well as self-reflexive poetic acts that add layers to an otherwise simple stroll through the courtyard. The poem reflects the inevitability of death and the human desire to be not only remembered but known.